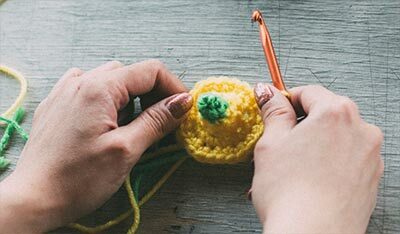 If you are the fastest crocheter in the world like Lily Chin, this might only take you an hour to make. 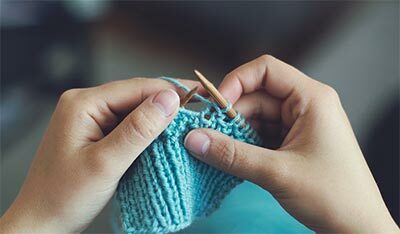 However, if you are an average crocheter, it will probably take an evening or two! 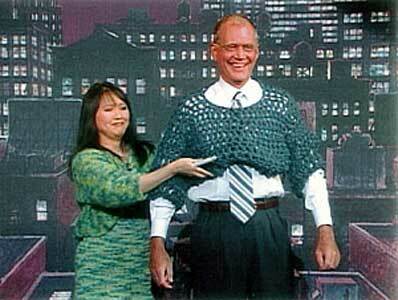 It's a perfect project to crochet while watching late-night TV!!! Lily Chin also designed another version of this sweater, which she calls the 1-Day Sweater, using a 15 mm hook (P). It's definitely a more fashionable look. It looks terrific over a tank top! The pattern follows the 1-Hour Sweater. Finished garment measures 42 (46)"
Total length = 25 (26)"
LION BRAND "Wool Ease Thick & Quick" (80% acrylic, 20% wool)--6, 6oz.-balls of Green Heather # 130. Crochet hook - 16 mm or Q OR SIZE NEEDED TO OBTAIN CORRECT GAUGE. 4 dc sts = 4" and 4 dc rows = 6". TO INSURE PROPER FIT, BE SURE TO CHECK YOUR GAUGE. Sweater is worked seamlessly in one piece from the top down. Turning ch 2 at beginning of rows does NOT count as a dc! Row 1 [RS] Ch 23 (25), dc in 3rd ch from hook and each ch across - 21 (23) dc. Row 2 and all rows Ch 2 and turn (does not count as a dc), dc in each dc across - 21 (23) dc. Work until piece measures 10 (12)" total from beginning or 7 (8) rows total. Pull loop long with about 6" of tail, cut yarn. Shoulder: Turn Back Yoke upside down. Row 1 With RS facing, attach yarn to beginning of underside of foundation ch, ch 2. Working into bottoms of ch's, dc in each of first 6 (7) ch, ch 9, skip 9 ch, dc in each of last 6 (7) ch. Row 2 Ch 2 and turn (does not count as dc), dc in each of first 6 (7) dc, hdc in each of next 2 ch, sc in each of next 5 ch, hdc in each of next 2 ch, dc in each of last 6 (7) dc - 21 (23) sts. Row 3 and all rows Ch 2 and turn (does not count as a dc), dc in each st across - 21 (23) dc. Work until piece measures 10 (12)" total from beg or 7 (8) rows total. Join with sl st to beg of same row of Back Yoke. Go back to open loop at end of last row of Back Yoke, join with sl st to beginning of same row of Front Yoke, fasten and end off this end of yarn. All rounds Working in rounds from here on, ch 2 and turn (does not count as a dc), dc in each dc around - 42 (46) dc, join with sl st to beg of round. Work until body measures 15 (14)", fasten and end off. With RS facing, join to underarm. Sleeves are worked in the round. Round 1- Ch 2 (does not count as a dc), work 10 (12) dc's evenly spaced along one side of armhole and 10 (12) dc's evenly spaced along other side of armhole - 20 (24) dc's, join with sl st to beginning of round. Round 2- Ch 2 (does not count as a dc), dec first 2 dc's tog, dc in each dc to within last 2 dc, dec last 2 dc's tog - 18 (22) dc's, join with sl st to beg of round. Round 3- Ch 2 (does not count as a dc), dc in each dc around, join with sl st to beginning of round. Medium: Repeat round 3, then dec as per round 2. [Work 2 rows even, then work dec round] 3 more times, work one row even = 10 sts and 15 rows. Large: Repeat Rounds 2 and 3 five more times with 2 less sts for every 2 rows. Work 2 rows of dc on remaining 12 sts, fasten and end off. Finished garment measures 48". Total length = 26". LION BRAND® "Wool Ease Thick & Quick" (86% acrylic, 10% wool, 4% rayon)-- 6, 6oz.-balls of Wheat # 402. OR SIZE NEEDED TO OBTAIN CORRECT GAUGE. 5 dc and 3 dc rows = 4"
Sweater is worked seamlessly in one piece from the top down. Turning ch 2 at beg of rows does NOT count as a dc! Row 1 [RS]- Ch 32, dc in 3rd ch from hook and each ch across - 30 dc. Row 2 and all rows- Ch 2 and turn (does not count as a dc), dc in each dc across - 30 dc. Work until piece measures 12" total from beginning or 9 rows total, pull loop long with about 6" of tail, cut yarn. Row 1- With RS facing, attach yarn to beginning of underside of foundation ch, ch 2. Working into bottoms of ch's, dc in each of first 9 ch, ch 12, skip 12 ch, dc in each of last 9 ch. Row 2- Ch 2 and turn (does not count as dc), dc in each of first 9 dc, hdc in each of next 3 ch, sc in each of next 6 ch, hdc in each of next 3 ch, dc in each of last 9 dc - 30 sts. Row 3 and all rows- Ch 2 and turn (does not count as a dc), dc in each st across - 30 dc. Work until piece measures 12" total from beginning or 9 rows total. Join with sl st to beginning of same row of Back Yoke. Go back to open loop at end of last row of Back Yoke, join with sl st to beg of same row of Front Yoke, fasten and end off this end of yarn. All rounds- Working in rounds from here on, ch 2 and turn (does not count as a dc), dc in each dc around - 60 dc, join with sl st to beg of round. Work until body measures 14", fasten and end off. Round 1- Ch 2 (does not count as a dc), work 15 dc's evenly spaced along one side of armhole and 15 dc's evenly spaced along other side of armhole - 30 dc's, join with sl st to beginning of round. Round 2- Ch 2 (does not count as a dc), dec first 2 dc's tog, dc in each dc to within last 2 dc, dec last 2 dc's tog - 28 dc's, join with sl st to beg of round. Rep Rounds 1 and 2 six more times with 2 less sts for every 2 rows. Work 1 row of dc on remaining 14 sts, fasten and end off.